Like other branches of the U.S. military, the Marine Corps has a large legal administration department, but not all of them are lawyers. If you're interested in a legal career after your tour of duty is completed, the job of legal services specialist, which is military occupational specialty (MOS) 4421, will provide the training and expertise you'll need. Their general duties include legal operational, managerial, clerical and administrative duties within a legal services support section (LSSS), law center, or office of the staff judge advocate. In fact, the only area in the legal administration section that the legal services specialist isn't involved in is courts-martial reporting, which is handled by MOS 4429, legal services reporter. The civilian equivalent of the legal services specialist would be a legal secretary or paralegal. Marines in this position handle all variety of legal work, including research, preparing forms, reports, wills, powers of attorney and other documents that deal with legal and quasi-legal matters. Their office responsibilities include checking any completed work for typos, keeping correspondence, directives and other files in order. If they're senior in grade, this position will act as legal services chief and senior enlisted adviser directly responsible to the officer in charge or staff judge advocate. The legal services chief acts as the active liaison between the command when dealing with enlisted policy and duty assignments, and adviser to the judge advocates with regard to enlisted instruction and supervision. To be qualified for this position, a Marine needs a general technical (GT) score of 100 or higher on the Armed Services Vocational Aptitude Battery (ASVAB) test. Since they'll be dealing with a lot of documents, legal services specialists need to be able to type 35 words per minute. And they'll be required to complete the legal services specialist course. Due to the nature of the job, involving potentially legally-sensitive information requires that legal services specialists have no nonjudicial punishments on record. If you've been convicted by a court-martial or civilian court for any offense involving controlled substances, or any offense involving moral turpitude, you would not be eligible for this MOS. A job similar to legal services specialist would be MOS 0151, administrative clerk. This job's responsibilities include clerical and administrative duties in a more general office setting, whereas MOS 4421 has specific legal administrative duties. Although you won't leave the Marines with a law degree, you'll be well-positioned if you want to pursue a legal career. To become a lawyer, you'll need to go to law school, but to work as a legal secretary, legal assistant or paralegal, you'll have all the skills and training you'll need. 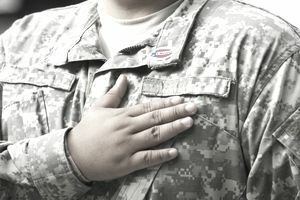 Many law firms like to hire veterans because they're disciplined and pay close attention to details. These are important traits for anyone working in the legal profession, regardless of their role.